Are you brave enough to try these Flamin' Hot Cheetos marshmallow treats? When we’re craving a snack, some of us prefer them sweet and sugary. Others go for salty and spicy. This recipe combines the whole sweet-savory pendulum in one powerful bite. Crunchy, salty, and of course, bright red — these are Flamin’ Hot Cheetos marshmallow treats. 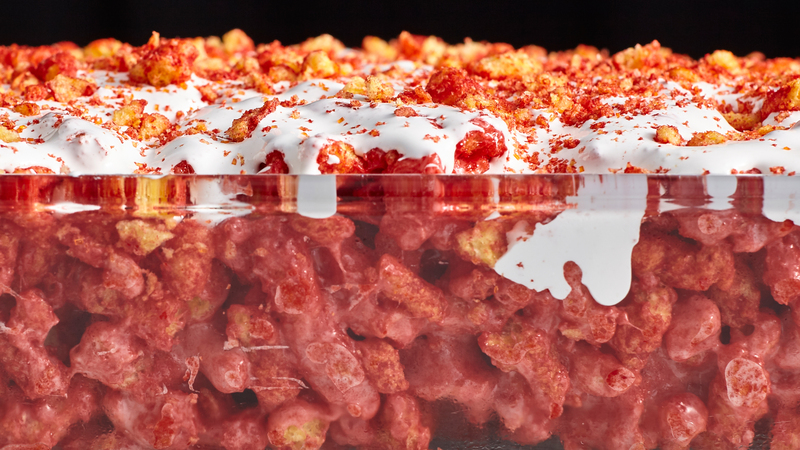 Just like your favorite cereal treats, but made with the cult favorite hot Cheetos instead. Any fan of the finger-staining snack will love every bite of this treat. The marshmallow keeps it tasting sweet, until the heat creeps up on you. If you want to try a different and fun dessert, make this for a party and see who dares to try it. Guaranteed every single person will have a strong opinion, whether they love it or leave it. If you’re a lover the heat, then pick up this spicy treat. Active 20 min. Total 35 min. 1. Lightly coat a 13- x 9- x 2-inch baking dish with cooking spray. Set aside. 2. Working in batches, place Cheetos on a clean work surface and crush by hand until they’re broken into small pieces; place pieces in a large bowl. 3. Place 1 cup of the Cheetos pieces in a ziplock plastic bag. Using a rolling pin, roll until finely crushed. Reserve for garnish. 4. Melt butter in a large saucepan over medium-high heat. Add marshmallows and cook, stirring occasionally until smooth, about 3 minutes. Pour marshmallow mixture over Cheetos and stir until thoroughly combined. Scrape mixture into prepared baking dish. Place a piece of parchment paper on top of mixture, and press firmly to form a compact, even layer. Let stand at room temperature until set, about 15 minutes. 5. Lightly coat a rubber spatula with cooking spray, and spread marshmallow creme evenly over Cheetos mixture. Sprinkle top with orange sprinkles and reserved crushed Cheetos. Cut into 12 squares, and serve.